Responses to the survey showed all services were providing at least one kind of support to forensic carers, though this might only be a link with the key worker or named nurse for the relative, and/or providing information leaflets. It did not imply that comprehensive packages of support were on offer to carers. The paragraphs below suggest the picture was rather patchy, with concentrations of good practice in a few areas and very little carer support in others. Carer support ranged from low level support such as provision of general information leaflets, newsletters and websites to more intensive and proactive support and interventions through carers support groups, one-to-one support, and offering behavioural family therapy sessions. Forensic mental health services staff were reported to be facilitating and attending carer support groups, and to be taking a lead role in offering support and assessment to carers. 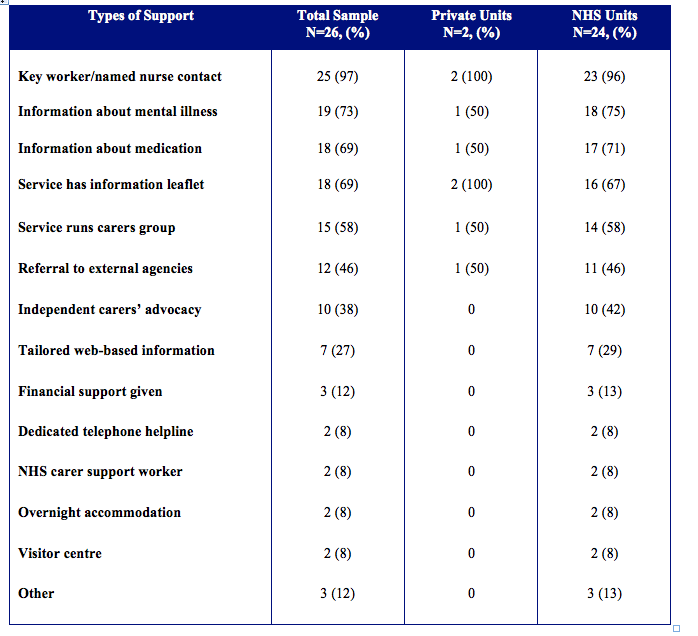 Table 4 below illustrates the types of carer support being provided by forensic mental health services. The majority of services (97%) said carers could receive support from a key worker or named nurse. Almost three quarters (73%) said they provided information on mental illness, and 69% that information was available for carers on medication, as well as there being information leaflets about forensic units. Fewer respondents (58%) identified their service as providing a carer support group, and just 39% identified independent advocacy for carers being available in their area. We are unable to comment on the content and quality of information for carers as only three survey respondents forwarded materials to the research team, some of which was comprehensive, and others exceedingly brief. The State Hospital provides a comprehensive range of support and information, co-ordinated through a dedicated carers centre, with information widely available on its website and a regular newsletter for carers. Less frequently available were dedicated telephone helplines for carers, NHS carers support workers, overnight accommodation, and visitor centres. A minority of respondents also highlighted provision of Behavioural Family Therapy, home visits from workers, and user and carer involvement activity. Of the services offering a carer support group, these typically took place on a monthly basis. One community forensic mental health service reported hosting such a group for the last 15 years. This group was always attended by a senior psychiatrist and other staff, encouraged peer-to-peer support with carers choosing to exchange telephone numbers and produce their own newsletter and DVDs; the latter targeting both carers and staff education. Some services promoted carer support groups run by a voluntary sector organisation but were unsure of the level of forensic carer participation, or if the particular needs of forensic carers were met in groups offering more generic support to mental health carers. Some areas reported an absence of relevant forensic carer forums in the community. There appeared to be a general mismatch between forensic carers’ needs relating to different levels of secure care with the focus and location of existing groups. One respondent mentioned the National Forensic Carers Conference held every two years as an example of how carers as a group are supported. Different health and social care professionals in forensic mental health services, as well as carers and other external facilitators, were said to be responsible for supporting carers. However, most responding services (88%) identified nurses, followed by social workers (48%), then doctors (36%) as being responsible.